In large bowl, beat Cake Layer ingredients with electric mixer on low speed 30 seconds. Increase speed to medium; beat 2 minutes, scraping bowl occasionally. In separate large bowl, mix Ricotta Layer ingredients until combined. Fill each muffin cup about one-third full with cake batter (you may not use all the batter). Divide ricotta mixture evenly among cups. Bake 30 minutes or until toothpick inserted in center comes out clean. Cool in pan 10 minutes; remove from muffin cups to cooling rack. Cool completely, about 30 minutes. Garnish cupcakes with white chocolate shavings or chocolate chips. Cupcakes taste even better the next day if covered and chilled overnight. 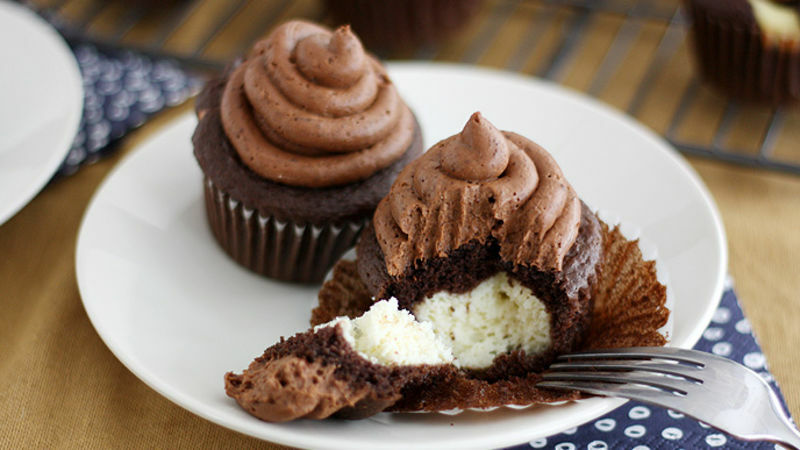 Any leftover cake batter can be baked into regular cupcakes then frozen for a later use.